My name is Brooke Solomito and I am almost a Junior at Wright State University. I have been at Wright State since 2016. I have seen the decline up until this point! Quite frankly, I am not going to blast you with threats but what I will express, is what I have observed these past two years and mostly what has occurred these past two weeks. When I first started at Wright State University, I did not have the confidence that I currently have now. All throughout my grade school years, I had an Individual Education Plan which gave me academic accommodations inside of the classroom. I am legally blind in one eye and I also have ADHD. The IEP did help me in the classroom but it did not help me when I was outside of the classroom. My peers and my IEP Case Manager had used my disabilities to judge my intellectual capability. When I was a freshman in high school, my IEP Case Manager had held me back in math because she did not think I could handle moving on to the next math course. I did not get past algebra 2 when I was in high school. take at Wright State. I had to go through the DEV, college algebra, and trigonometry courses. Now two and a half years later, I am now in calculus 1. This journey so far has not been easy but worth it because it has made me realize my calling and purpose in life. For so long, I thought that I was never going to find my place and that I had no purpose. This had changed when I met the faculty that Wright State had to offer. They have poured out belief in me, when at times, I did not have belief in myself. They never let me give up even when it was the easiest thing to do. I am glad that they didn’t because I would not be the confident and determined student that I am today. I aspire to be a college Math/Statistics professor. I intend on getting my BS in Statistics, Disability Studies minor, and a MS in Applied Statistics. I want to have the same profound impact on another student’s higher education aspirations just as the faculty at Wright State have done for me. Furthermore, I want to pour belief and confidence into another student’s life that may be experiencing the same thing as I once did when I was a college student. While I was supporting my faculty who are on strike, I had collected data from 200 AAUP-WSU Faculty Union Members that had given me the course and course sections they are not currently teaching because of the strike. Within my calculations, I had excluded anything that was researched based such as independent studies and practicums since different departments handle them in different ways. 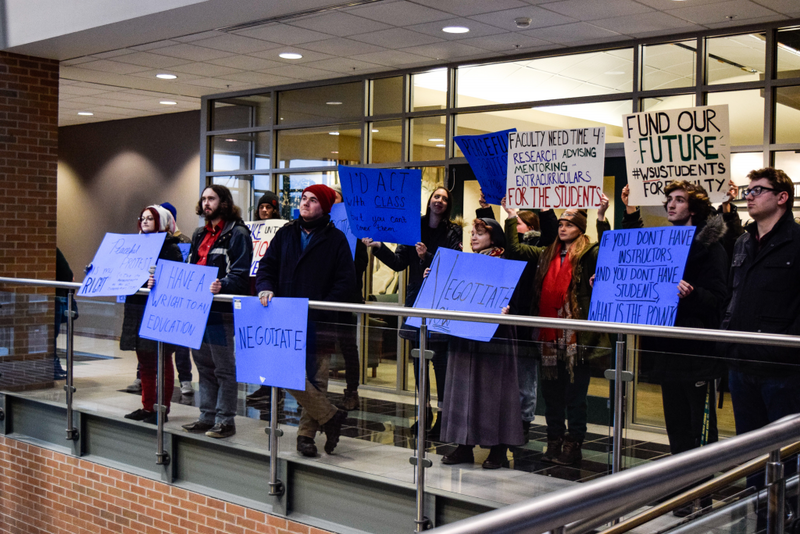 From the Lake campus, a total of 61 out of the 295 sections were from AAUP-WSU Faculty. 57% were lower level courses and 43% were upper level courses. For the Dayton campus, a total of 578 sections were reported out of the 2502 sections being offered for the Spring semester. 30% were lower level courses and 70% were upper level courses. Students do not go to a university for the first two years of a college, they come for the latter part of their college degrees because that is what is going to contribute most to the major one pursues. heart of the degree that will be with graduates for a lifetime. Moreover, the WSU policy developed with HLC states that there should be at least 750 min/credit hours of face-to-face class time. I have also been collecting student data of courses that are not being covered by their original instructor. These replacements have made belittling remarks and threats to students. Some of these replacements are taking attendance, assigning an assignment, and then dismissing the class – with little to no instruction taking place. Some do not have the proper qualifications to teach the courses they have been given. Some of the music students were basically told to go to practice rooms and practice by themselves. The Wright State University faculty are the finest example of what a good professor should be. So much so, I desire to be one of them. They are brave, strong, and unwavering of keeping the Wright in Wright State. They are standing for what they believe in despite the repercussions that come with going on strike. They are doing this because they want the best for students both present and future. The families and our student educations depend on the fair contract of 2019. The high-quality education that the faculty union members can provide, will lead us to a bigger and brighter future and mold us into professionals that we desire to be. I was once asked the question; what does the ideal victory look like after the strike? Well, the AAUP-WSU Faculty Union members have a fair contract that would not diminish the quality of education the study body receives. Most of all, I want to have the instructors that attracted me to Wright State. Moreover, the AAUP-WSU Faculty play a vital role in the operation of the university and I want the university that I know and love to be standing for my future of being a face of Wright State University of tomorrow.